A team of astronomers has detected the sonic boom from an immensely powerful cosmic explosion, even though the explosion itself was totally unseen. The titanic eruption, known as a Gamma Ray Burst (GRB), was generated by the collapse of a massive star in a galaxy nearly 300 million light-years from Earth. 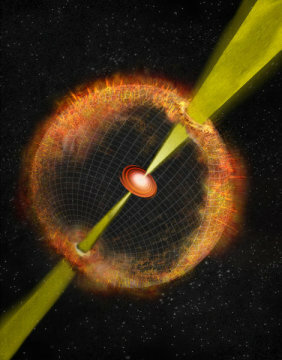 Artist's conception of a Gamma Ray Burst. Jets of fast-moving material are propelled outward through a spherical shell of ejected material from the initial explosion of a massive star and its collapse into a black hole. A team of astronomers has detected the sonic boom from an immensely powerful cosmic explosion, even though the explosion itself was totally unseen. For years, astronomers have been hunting all over the sky for an example of this strange phenomenon, known as an "orphan afterglow." At last, now they've finally found one. The titanic eruption, known as a Gamma Ray Burst (GRB), was generated by the collapse of a massive star in a galaxy nearly 300 million light-years from Earth. In the process, the star collapsed into either a dense star called a magnetar, or more likely, a black hole. Typically, GRBs release a prodigious amount of energy, as much as the Sun would release over ten billion years. The blast generates two jets of gamma rays which travel out from the collapsing star in opposite directions at nearly the speed of light. When these jets are pointed at Earth, astronomers see these focused outpourings of energy as intense flashes of gamma-rays. But, GRB jets are very narrow, and because the jets from this particular collapsing star weren't pointed at us, the GRB itself was completely undetectable. However the GRB's jets crashed into the gas that surrounded the original star, producing a huge shock wave akin to a sonic boom. This heated up the gas, producing a glow that radiated radio energy in all directions. "This is the first time anyone has been able to capture the sonic boom from an unseen GRB explosion," says Bryan Gaensler, a co-author on the paper describing the observation. "In the past, people have either seen the explosion and then seen the boom, or on one or two occasions have seen the boom and then looked back and recovered the explosion after the fact. But here we have seen the boom, and yet the preceding explosion seems to be completely missing as viewed from Earth." Gaensler is Director of the Dunlap Institute for Astronomy & Astrophysics, University of Toronto. The paper, whose lead author is Casey Law, University of California at Berkeley, is being published in the Astrophysical Journal Letters. Gaensler, Law and their colleagues made the discovery by comparing data from previous radio surveys of the sky with data from the Very Large Array Sky Survey (VLASS), being conducted with the Karl G. Jansky Very Large Array in New Mexico. "We compared images from old maps of the sky and found one radio source that was no longer visible today in VLASS," says Law. "Looking at the radio source in other old data shows that it lived in a relatively nearby galaxy, and back in the 1990s, it was as luminous as the biggest explosions known, gamma-ray bursts." The source's brightness, as well as its evolution over the decades, were clues that it originated from a GRB. Another was that it was found where astronomers expected to find GRBs: in a relatively small galaxy, of a type known as "dwarf" galaxies. The discovery provides crucial new insight into the nature of GRBs and their jets. Given that GRBs are pointed in random directions relative to us, the fraction we see from Earth depends on how narrow or wide the jets are. "By comparing the number of 'orphaned' afterglows to those with GRBs preceding them," says Law, "we can measure that fraction much more precisely than before." The analysis also promises a far more accurate GRB census, made possible using today's modern astronomical radio surveys that scan large portions of the sky. For example, over the next 7 years, the VLASS will make three complete scans of 80 percent of the entire sky. Says Gaensler, "This shows the exciting capabilities of the new generation of wide-field radio surveys. There are dramatic and dynamic explosions and flares happening out there, but we can only find them if we can constantly patrol the sky to see what's changing."